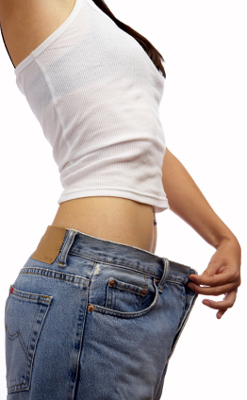 The best weight loss tips to help you lose belly fat and thigh fat should be safe and sensible. Nutrition tips for weight loss is where it all starts. You can eliminate belly fat permanently by committing to a more positive way of eating. Getting rid of belly fat and thigh fat are normally at the top of a woman's goal list for physical self-improvement. However, getting the right information can be frustrating because the Internet is loaded with "quick weight loss" sites and they are marketed aggressively. You can lose belly fat with a proven, comprehensive program of slightly reducing calories each day, getting regular and consistent exercise (that includes weight training) and integrating a session of moderate cardio each day for 30-40 minutes. Tips for weight loss work best when they become integrated into your lifestyle as you discard less positive habits. * Everyday...eat a healthy breakfast. After sleeping eight hours, your body needs fuel. Skipping breakfast can lower your basal metabolic rate by 40%. STAY AWAY from packaged sugar cereals. Make sure your breakfast includes good sources of protein and complex carbs. * Drink at least 64 ounces of water each day. The benefits of drinking water cannot be overstated. It is easy to cut calories when you substitute water for pop, beer, energy drinks, and juices. * DO NOT allow yourself to get too hungry, and DO NOT eat until you feel stuffed. Snack on fruit, cut vegetables, solid protein sources, and cold water if you feel hungry between meals. * Eat at least 3 servings of fruit each day. (DO NOT substitute fruit juices. They have way too much sugar.) Whole fruits are fibrous and will decrease the calories your body can absorb. * One of the best weight loss tips we have is to completely stay away from sugar foods and desserts. If you can't do this very well, right now, limit yourself to ONE serving of 200 calories or less twice each week. Cut back to once a week when you feel stronger about your goals. * DO NOT snack after dinner. You only have a few hours between dinner and bedtime, do not allow it to be mindless eating in front of the TV. If you really feel hungry, eat an apple and put a dab of peanut butter on a couple of slices. * On the subject of apples...Slice and eat one about 20 minutes prior to each major meal. They are extremely fibrous and make you feel full. You'll consume less calories at breakfast, lunch, and dinner. * Stay away from foods that contain hydrogenated or partially hydrogenated fats. Think FRIED...because that will be your internal organs if you continue with this type of food choice. Deep fried foods are normally high in calories, contain fats that are highly processed, are low in fiber, and extremely low in nutritional value. If you are stuck eating fried chicken, peel off the skin. * Avoid drinking alcohol as much as you can. The taste of alcoholic beverages enhances the taste of food and can sabotage your best fat loss goals. A night of partying with friends can negate a week's work of establishing a calorie deficit. * Exercise more than you were before you decided to follow some weight loss and diet tips. Your best strategy is to decrease calorie intake and increase your activity level. Walking and fat loss can go hand-in-hand with daily sessions of 30-40 minutes. The best weight loss tips on the planet are no good if you do not commit to a more positive lifestyle to enhance your body. You can do it! Start slow and build up. Learn all you can about how your body works and how food affects it. You can eliminate belly fat and thigh fat safely and sensibly.